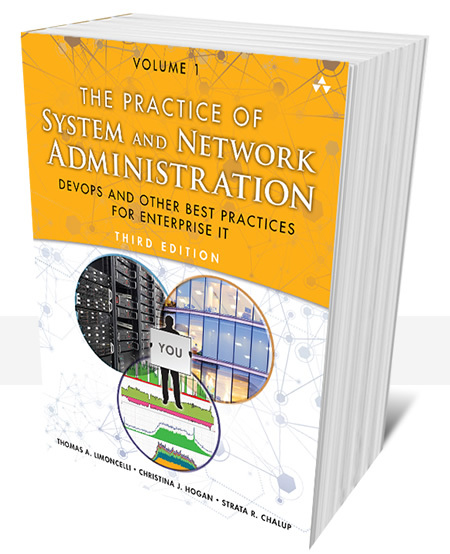 “The Practice of System and Network Administration” is different from most of the other technical books on a professional SA’s bookshelf. This book is about how to become a professional system administrator. The profession is about more than knowing obscure options to different commands. To become a professional, a system administrator needs to change mindset from a straight-ahead techie to a member of the team who has specialized expertise. Absolutely invaluable when planning a new site, working on an existing site, or explaining things to non-technical employees. This book is filled with practical, succinct and easily understandable advice for all aspects of networking. It is sufficiently vendor neutral to apply to practically any environment. It is also specific enough to be useful in the field. Justifications are readily available for all the tips and pointers given in this book, along with real world examples. Must have for sysadmins. I’ve been working as a sysadmin for almost 4 years and I highly recommend this to anyone, whether you’re a seasoned professional or someone looking to start a career is systems administration.